update, 8 Feb 2016: At least 37 people are now confirmed dead, at least 24 were in the Weiguan Jinlong apartment building. update, 7 Feb 2016: At least 124 people are missing after the collapse of the 17-storey block. At least 27 people are now confirmed dead. 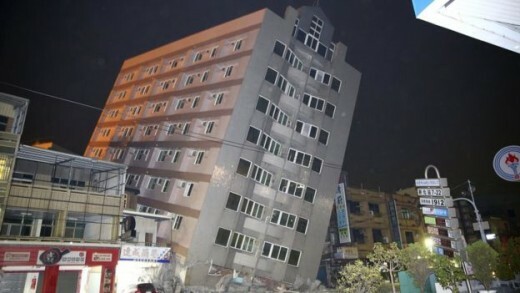 The 17 storey Weiguan Jinlong (Golden Dragon) apartment complex crumpled down on each other. The building was officially housing at least 256 people. However it is being reported that more than 300 were inside at the time of the collapse. update, 6 Feb 2016: at least 13 people killed, some 30 people missing from the 17-storey block; nearly 500 people were injured. 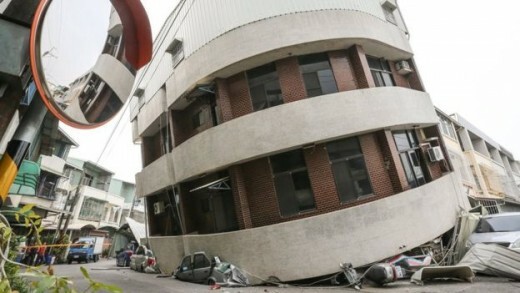 An earthquake has toppled buildings in the south Taiwanese city of Tainan, killing at least seven people, reports the BBC. Rescue teams have been trying to reach people trapped in rubble since the magnitude 6.4 quake struck just before 04:00 (20:00 GMT Friday). 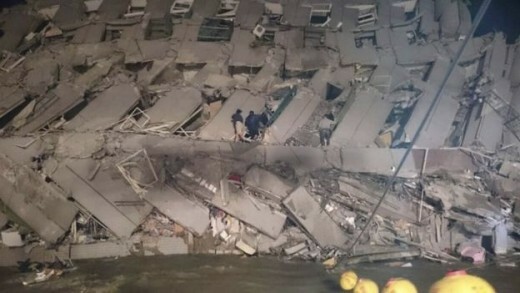 A powerful earthquake in Taiwan felled a 16-storey apartment complex – Wei-kuan Building – full of families who had gathered for Lunar New Year celebrations in the early hours of Saturday, with at least five dead and more than 30 feared trapped, reports the Tribune. The 6.4-magnitude quake struck in the middle of the night. An entire residential complex containing almost 100 homes toppled to the ground, lying on its side with twisted metal girders exposed. Officials said there were 256 residents registered as living in the building, which contained 96 apartments. “As a search for survivors in the rubble went on, questions were being raised about the construction of the Wei-guan Golden Dragon Building, with its floors that pancaked down on each other, reports Reuters. 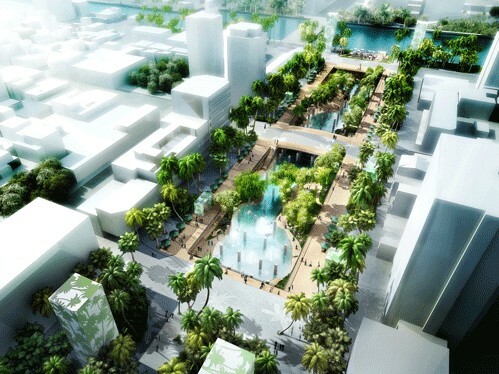 Five of the dead were from the apartment building in the southern city of Tainan. Buildings in nine other locations in the city of 2 million people had collapsed and five were left tilting at alarming angles, a government emergency centre said. City officials said it was too early to determine if poor construction was a factor in the collapse. 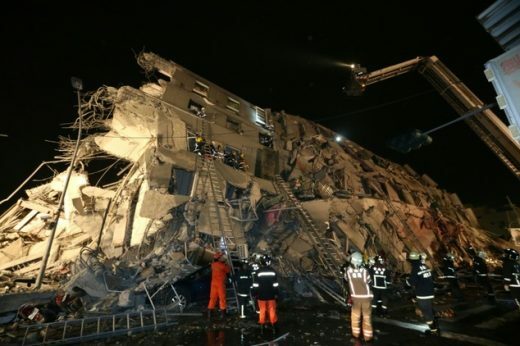 Liu Shih-chung, city government deputy secretary general, said television footage of the ruins of the commercial-residential building suggested the possibility of structural problems related to poor-quality reinforced steel and cement. The construction and engineering companies that built the complex are no longer operating. Clearly the construction sector has to redouble its efforts to prevent these collapses that seem to accompany almost all earthquakes across the globe. The knowledge is there on how to prevent this occurring. Governments and property developers in earthquake zones should come under pressure to ensure building regulations are appropriate and consistently checked for implementation.